Cousteau’s Oscar-winning 1956 documentary, based on his bestselling book of the same name, was his first film and a template for all the exploration/discovery type programming that would become a television staple in years to come. Rarely available on home video, I saw a screening several years ago at the Harvard Film Archive along with a sizeable student-age audience; it must have been assigned viewing for some course or the other. Welcomed by Cousteau’s universally-recognized, French-accented narration, we settled in for a vintage seagoing nature doc, little suspecting what lay ahead. At first, Silent World proceeds as a conventional, if visually spectacular, science-travelogue film. Future auteur Louis Malle, fresh from film school, does a lot of the cinematography and there are several spectacular scenes: a diver’s-eye view of plunging headfirst to a depth of 150 feet in clear tropical waters, a school of racing porpoises jumping ten feet in the air in patterned intervals, the Calypso pitching and rolling through an Indian Ocean monsoon as shot from the crow’s nest looking straight down at the bow. The educational aspects, like the part explaining the ocean’s deep scattering layer or “false bottom,” were intriguing. But the murmurs of appreciation turned to nervous laughter and gasps of disbelief with the mid-film arrival of the two notorious scenes that have since been dutifully noted on the film’s Wikipedia page. First the Calypso crew uses some TNT to blow to bits a coral pool in the interests of “scientific” investigation then call the results “tragic” (?!) before salting away the dead fish. Not long after, their vessel is steering (a mite too close) beside a herd of sperm whales when the baby of the bunch is accidentally killed by the ship’s propeller. When sharks, doing what comes natural for them, attack the wounded whale, the crew decides they must exact revenge upon their “enemy” and pull about a half-dozen sharks up onto the deck, slaughtering them in a spasm of ill-considered violence. 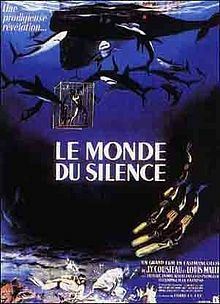 After a couple of more scenes of oceanic misadventure, The Silent World returns to a relative comfort zone until Cousteau asks “can man become more intimate with fish?” I could almost feel the audience brace itself, wondering if it were about to witness the ultimate indiscretion. Although a false alarm, you could hardly blame us at that point. As the Calypso sailed off into the 1956 sunset, I could at least comfort myself in the knowledge that Cousteau would soon become far more environmentally aware. And really, if you cut out the offending scenes, you’d have a one-hour program of some of the best marine documentary material ever. But that night, when the lights came up in Harvard’s Carpenter Center theater, there was nothing else to do but slink away without making eye contact.